It works by our unique formulation and manufacturing process of natural acids dissolving and removing dead skin cells attached to the outer layer skin (epidermis) and encourages new, healthy, hydrayted cells to grow leaving your skin glowing and with an amazing feel. It absorbs in to the pores and hair follicles where the keratosis lies and gently cleans them out getting rid of the unwanted protein (keratin). The other ingredients then come in to play. The Jojoba oil and Shea Butter gently softens and hydrates the skin and with the lotion's rich Vitamin A, B5 and E content, it penetrates deep in to the skin leaving an invisible barrier to help stop moisture leaving the skin. 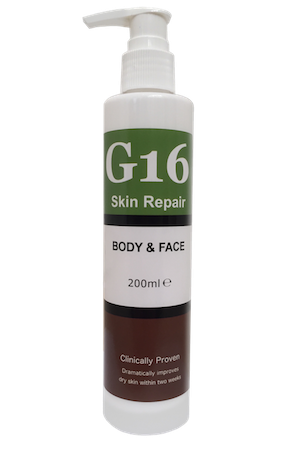 Formally SR Lotion, G16 Skin Repair Lotion is the best treatment available for these related forms of Keratosis and it’s time to get that confidence back as we have spent years perfecting G16 Skin Repair which is now helping thousands of people around the world. In fact in a lot of cases it has been seen to completely restore the skin to its normal form within just 2-4 weeks. It has outstanding results on several types of Keratosis such as Keratosis Pilaris, Stucco Keratosis, Actinic Keratosis, and Seborrheic Keratosis due to our unique manufacturing process. We know that you have probably spent lots of money trying lotions, creams and other products that claim to work, but we assure you that you will be extremely happy with G16 Skin Repair Lotion for Keratosis and that you will have the best looking skin you have ever had, which is why we offer a full money back guarantee.